A diving trip to the Great Barrier Reef may have unlocked a new way to build a GPS-like sensor that works underwater. The device is based on recent scientific understanding of how marine animals sense their geolocation based on the signature polarization patterns of light entering the water. 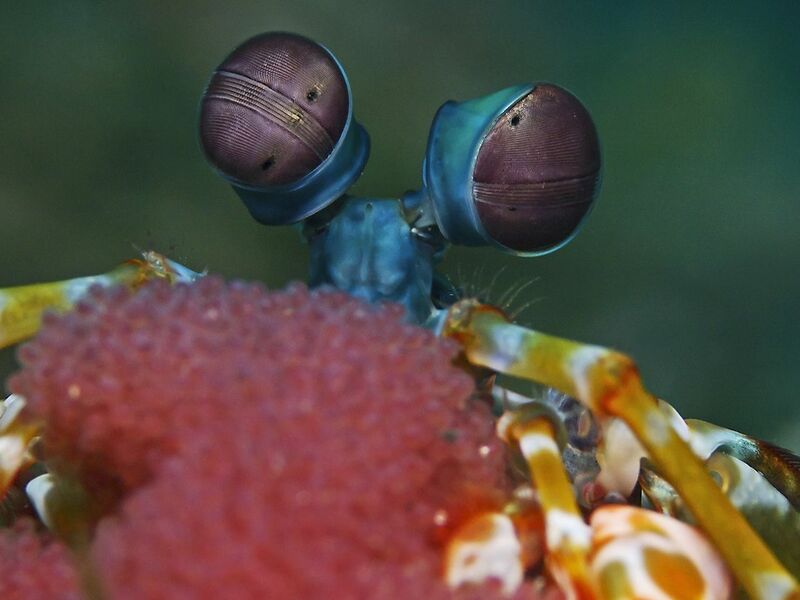 A few years ago, U.S. and Australian researchers developed a special camera inspired by the eyes of mantis shrimp that can see the polarization patterns of light waves, which resemble those in a rope being waved up and down. That means the bio-inspired camera can detect how light polarization patterns change once the light enters the water and gets deflected or scattered. Those researchers now realize that they can use those underwater polarization patterns to deduce the sun’s position—and use that to figure out the location of the camera itself. Traditional GPS technology based on radio signals from satellites cannot work under the sea, because radio signals do not travel well underwater. By comparison, Gruev and his colleagues demonstrated how the light polarization method for underwater geolocation can work at depths of as much as 50 meters below the surface. Their results were especially unexpected because many marine biologists have generally believed that light traveling through water is polarized only from a horizontal viewing direction. That would make it extremely difficult to get useful geolocation information from analyzing the sunlight filtering down through the ocean depths. But biologists also know that many marine animals, like many terrestrial animals or birds, seem to have polarization-sensitive eyes that can be used to hunt or navigate underwater. Gruev points out that earlier conclusions about polarization patterns were based in large part upon incomplete measurements and incomplete mathematical models of the underwater environment. The camera has shown that polarization patterns in light from the sun can be detected and measured from many different angles. 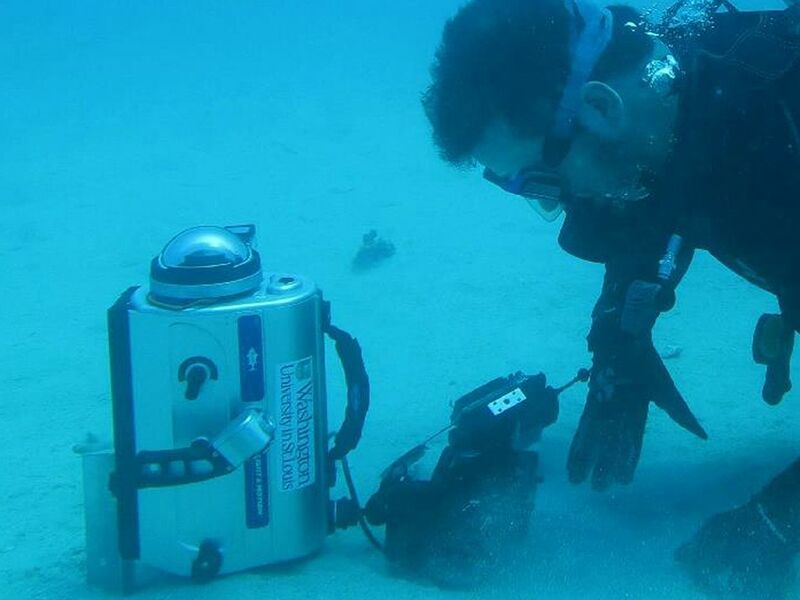 A diver uses the underwater polarization camera with fish-eye lens, in a configuration similar to how the sensitivity data were collected. During a diving field trip to the Great Barrier Reef, Gruev and his colleagues noticed that the background polarization patterns seemed to be changing in the underwater environment depending on the time of day and viewing direction. Once Gruev got back to the lab and began analyzing the polarization patterns with Samuel Powell, now a postdoctoral researcher at the Brain Institute of the University of Queensland in Australia, the researchers realized that those patterns changed depending on the sun’s position in the sky. The discovery led the researchers to conduct similar underwater tests at several different locations around the world over four years. They also tested the method under different weather conditions and at different depths. physical phenomena that affect polarization patterns but remain poorly understood. The researchers hope to shrink the current error range of this new version of underwater GPS in order to make it more practical. One way to minimize error comes from building more precise instruments. But the bigger challenge involves addressing errors in the software that derives the geolocation information from the light polarization patterns, Gruev said. I don’t think we fully understand nor we can fully estimate how the polarization properties of light are altered as they emerge from the sun and are collected by a sensor placed underwater. Many factors can influence polarization underwater, included aerial and underwater pollution. We need to develop new signal processing schemes to estimate all these factors and improve sensitivity. Once that is accomplished, Gruev envisions putting the technology in underwater robots resembling a “swarm of little GoPro-like cameras” that can use their underwater GPS capabilities to help discover new marine species, find missing shipwrecks and provide more information about how ocean environments change over time. It’s a concept that may find interested customers in both civilian and military circles.